It has been a very long time in waiting for this CD to come out. The bands first EP, Tooth And Helmet, was released in 2000 but the record label went under soon after. The band has been rocking the Helsinki psychedelic rock scene for 5 years now but was patient to get the right record deal for them. 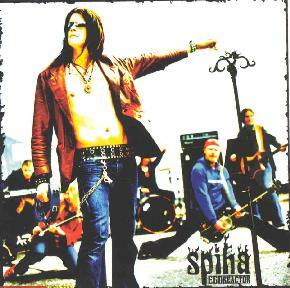 Spiha have a very distinct style of rock and roll and the singer, Henry Lee Rock, has a very special voice. The band creates really great grooves and melodic tunes. While the music on the new CD is not as psychedelic as their first release, many of those same psych elements are still there. The band consists of drums, bass, voice, keyboards and dual guitars! The CD opens with the title track, "Egoreactor", and is a powerful rocker with a heavy groove and some killer psyched out wah guitar. "Bloodrain" has a great groove with a cool synth line that gives it a very spacey psyched out feel. Still totally rocking. "Altamont" is MC5 meets Spiha. A great almost punked out groove with a catchy riff and chorus. Now the CD takes a turn and there are a few rock ballad songs that might get played on MTV (at least in Finland!). The first CD single is "If I Ever Let You Go". A very well crafted ballad. I really like the piano line and the way Henry sings. A great chorus ("Don’t tell anyone where I am when I’m with you"). I wonder if Guns and Roses will ever write as good a song as this again? The guitar riff is still quite heavy. "Samurai Of The Sword", also on the CD single, is next and more rocking but also more melodic and straight rock and roll. "Monster", which will likely be the second single, is another great well crafted ballad which like "If I Ever Let You Go" is based on a piano line. The end of the CD gets back to the roots of rock and roll. "Scratch" starts with a synth drone and then the drums and bass build up and we are rocking Spiha style! "Freedom Fuel", one of the best tracks on the CD, has this incredible stoned groove based on a strong driving groove with a piano line with a little delay on it. "I Ain’t The One" is a fast paced foot stomping rock number. "If I Ever Fall" begins slowly and reminds me of the Doors to start but is a slow dark ballad. A great song. The band has a 3 CD contract so look out for more from this great band! The first EP is out on vinyl now on the Freakophonic label in Denmark. It includes 4 extra songs on the original CD. Visit Spiha's labels at http://www.lowfrequencyrecords.fi and http://www.freakophonic.dk.